After flood, village proves it’s more than just a pretty Hill Country town. On Sunday, May 24, as news of overnight massive flooding along the Blanco River emerged, I received an email from The New York Times. As an independent journalist, I sometimes conduct interviews and identify sources in the Austin area for the paper’s writers. I drove to Wimberley a few days later to report firsthand on the aftermath. Seeking a way to send in my notes, I stopped by the Chamber of Commerce building. The staff graciously lent me an Internet connection, a comfortable chair and a table. As I typed away, chamber director Cathy Moreman came in and asked me for a favor: Please ask people to visit Wimberley. Late in the summer, I returned with my 22-year-old daughter, Bridget, to grant that favor. The day we arrived, the pale green waters of the Blanco flowed serenely beneath the RM 12 bridge, but along its banks, cypress trees stripped of limbs and bark or lying like matchsticks on the ground served as stark reminders of the horrific flood that killed 12 people. The high water mostly affected property directly along the Blanco, meaning most restaurants, shops and other businesses in town had remained dry. Residents immediately rallied after the flood, picking themselves up, helping one another out, dusting off and moving forward. It turns out Wimberley has a history of doing just that. We joined a steady stream of cars driving into the town square — stopping politely at crosswalks for pedestrians — and pulled into a beehive of activity. Everywhere, blue flags reading “Wimberley Strong” fluttered in the breeze. Sale of the flags, designed and produced by local Eagle Mountain Flag Company, raised money for local charities providing flood relief. Six hundred were flying so far, and owners Mike and Vickie Young said they will keep making flags as long as people want them. 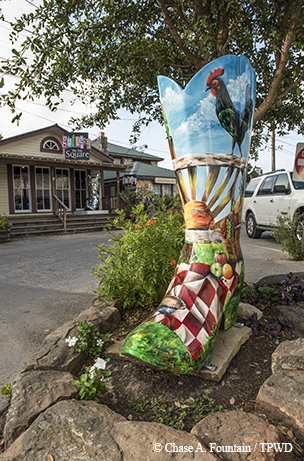 Bootiful Wimberley celebrates the arts with decorated boots around town. We stayed in a cozy log cabin near the square, overlooking Cypress Creek. The creek flows through town, beneath the shade of cypress trees and over limestone rapids. Weathered chairs, rock steps to the clear water and rope swings dangling from limbs testify to the creek’s long-lasting popularity. Cypress Creek has always played a major role in this town. Early settlers built mills on the creek, which begins at a nearby artesian spring, forms a popular swimming hole just below the square and empties into the Blanco. We enjoyed our first dinner at The Leaning Pear, a restaurant overlooking the creek’s grassy, tree-lined banks. Native Texans Rachel and Matthew Buchanan opened it in 2006 in the restored Lowery House, one of Wimberley’s oldest stone structures. The couple tapped into their time spent in Italy and Matthew’s degree from the Culinary Institute of America to focus on seasonal, local food. In August 2013, they moved into an airy new building across the parking lot, where a back wall of glass and large outdoor seating area flanked by rain cisterns and herb gardens take advantage of the creek view. The next morning, we had breakfast at Mima’s Kitchen, consuming tacos on fresh-made tortillas under large oaks and colorful umbrellas on the outdoor patio. Tony and Helen “Mima” Sauceda started out selling fajita tacos cooked on a barbecue pit on their driveway to Market Days patrons in 1994. It was such a hit that the Saucedas made things permanent on July 4, 1995. Market Days has been a Wimberley institution since 1964, held the first Saturday of every month, except January and February. The shopper’s paradise now occupies about six shady acres with more than 475 booths selling antiques, yard art and everything in between — clothing, plants, furniture, tools, hats, jewelry and food. It began as local vendors setting up on truck tailgates around the town square, offering live pigs, homemade tamales and other unique fare. The local Lions Club later took on the event and, when it grew too big for the square, moved it to the current location on FM 2325. Proceeds go to charities, scholarships and community projects — a total of roughly $500,000 a year, according to administrative manager Lee Gibson. Shopping to support good causes sounded good to me, and I made a note to return soon on the proper weekend. Fortunately, any weekend is the proper one for Blue Hole, another Wimberley institution. This iconic swimming hole once sat on private land, and for almost 100 years folks could pay to swim and camp. But plans were afoot for residential development. The community came together, raising more than $873,000 in private donations and securing funds from the National Park Service Land and Water Conservation Fund, Hays County, the Lower Colorado River Authority and TPWD. The city purchased the property and created a regional park that opened in 2011. Based on a master plan created by the Lady Bird Johnson Wildflower Center, it includes a natural swimming area (open Memorial Day to Labor Day), 3.5 miles of nature trails, primitive camping, fire pits, playgrounds and volleyball and basketball courts. 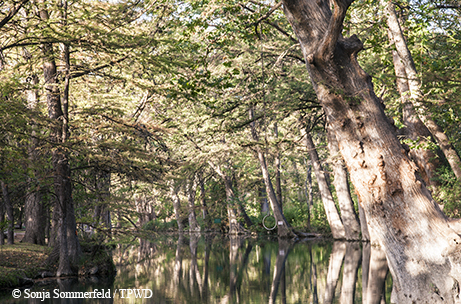 Cypress-shaded Blue Hole, a popular swimming spot in town, provides a place to cool off in a spring-fed creek. The second Saturday of every month, Hays County Master Naturalists lead hourlong guided hikes in the park, doling out interesting facts and trivia. After our informative walk, we sat in the shade by the creek listening to the water and the breeze, grateful that Wimberley saved this treasure. Wimberley also saved another treasure: Old Baldy, a steep little knob of a mountain near the high school. It has long been tradition to climb its 218 stone steps, installed by then-owner Ed James in 1950 (along with a dance floor on the top). No doubt a few first kisses and proposals occurred on this peak, as well as some good, clean fun and perhaps a bit of mischief. “As a kid, I would climb Old Baldy and look out over the valley,” says attorney Andrew Weber. “In 2014, I heard that it was for sale and just had a visceral reaction that this couldn’t be right. There had to be a way to keep it open to the public.” Locals formed the Save Old Baldy Foundation, worked out an agreement for the city to provide half the money to purchase the land, and raised the rest. Local artists created works to support the effort, Wimberley’s many musicians held fundraising festivals, and restaurants donated proceeds from special dinners (a pattern of community spirit repeated and magnified after the flood). Another must on any visit to Wimberley is Jacob’s Well Natural Area, site of the springs that create Cypress Creek a few miles northwest of town. A trail leads from the parking lot through scattered juniper to a limestone ridge. Below us, water emerged from limestone caves and channels of the Trinity Aquifer to form a circular pool an unearthly shade of blue. I could see about 30 feet down into clear water pierced by sunlight; beyond, it reaches 140 feet deep, and the actual well is a mile long. Water used to flow from the springs with such force that it would push swimmers out, but increased pumping and development have reduced that power. In 2000 and 2008, the well even dried up, inspiring creation of the natural area. In addition to its natural attractions, Wimberley is home to many shops, restaurants and galleries. 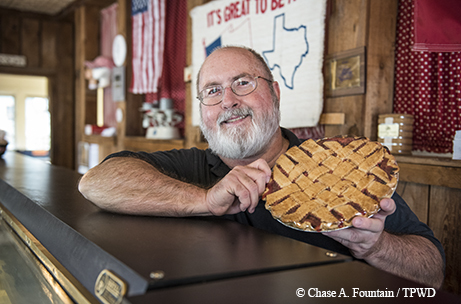 The Wimberley Pie Company has been providing delectable treats since 1989. After a hearty breakfast at Wimberley Café on the Square the next day, we visited the EmilyAnn Theatre and Gardens. Its indoor theater and outdoor amphitheater hold Shakespeare Under the Stars in summer and productions throughout the year, but these 12 acres offer plenty of off-stage diversions as well: trails, native gardens, a hilltop veterans memorial, children’s play areas, giant chess and checkers, a musical garden, a picnic grove, sculptures, disc golf, sandboxes, a fairy land and more. Every night from the Saturday after Thanksgiving through Dec. 29, these grounds host a trail of lights, more than 100 exhibits along the walking paths, live entertainment and a yule log bonfire complete with complimentary hot chocolate and marshmallows to roast. Spending three days in Wimberley, I realized that the words on all those flags — strength, hope, courage — go beyond an upbeat slogan here. They describe a way of life, whether for people mobilizing to save a beloved swimming hole or rallying to recover from a terrible tragedy. Turns out that by coming here, I was doing myself a favor. » Like this story? If you enjoy reading articles like this, subscribe to Texas Parks & Wildlife magazine.